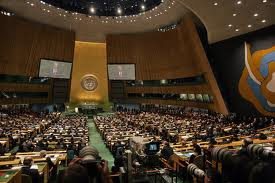 Forty-eight hours before the UN General Assembly session at which Palestine's application for Observer State status is to be voted on, a European Union source predicts to Inner City Press, after polling, that up to 15 EU members will vote Yes. The source said the total of No's membership-wide might be as low as 10, including Israel, Canada, the United States "and its satellites." As a "non-member state", Palestine would have the same status as the Vatican. The Observer Mission of Palestine to the UN has circulated a revised version of the draft resolution. 7. Requests the Secretary-General to take the measures to implement the present resolution and to report to the Assembly within three months on progress made in this regard.